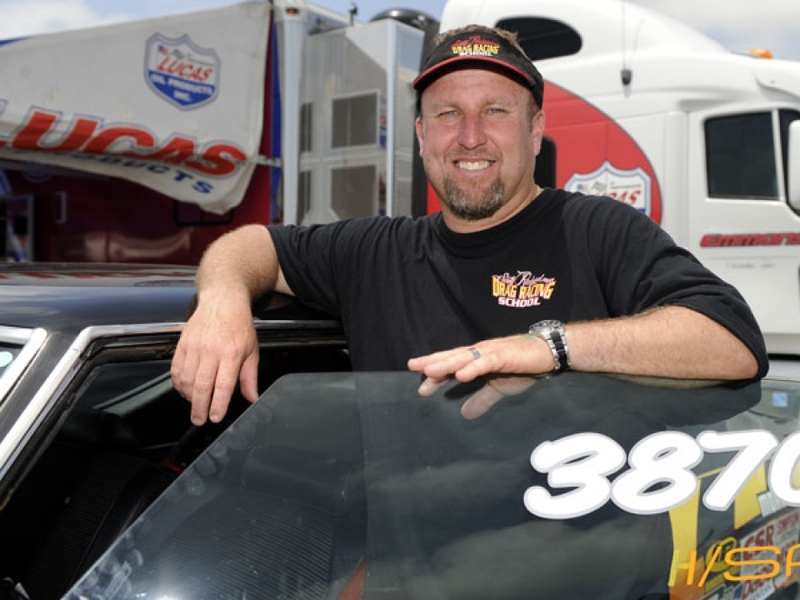 Clay City, KY - Former NHRA national champion and many-time race winner Scott Richardson has signed a lease of the track for 2017 and beyond. “It’s an exciting time,” says Richardson. 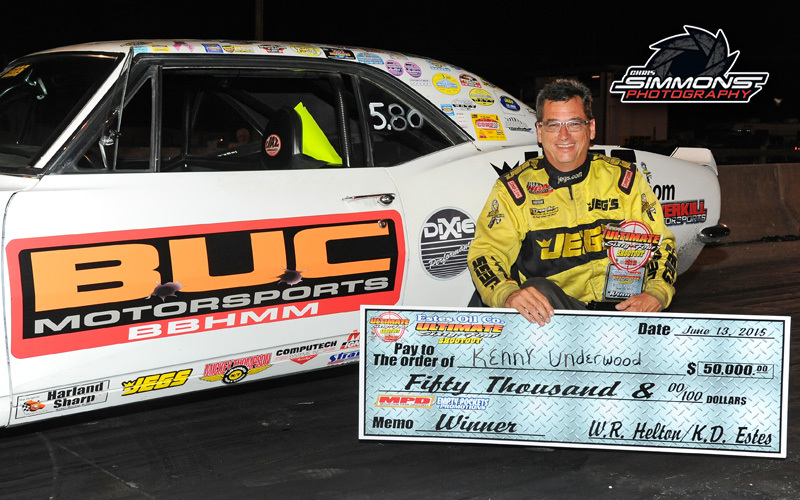 Clay City, KY - Kenny Underwood checked another off of his bucket list of Big Bucks accomplishment's with a dominant win of the $50,000 Ultimate 64 Shootout this past weekend in Clay City. Underwood also won the $10k shootout in his dragster. Clay City, KY - Racers, crew members, and fans will have the unique opportunity to take a ride with multi-time NHRA champion Jeg Coughlin, Jr. in the JEGS Chevy II Station Wagon at the Ultimate 64 Shootout. 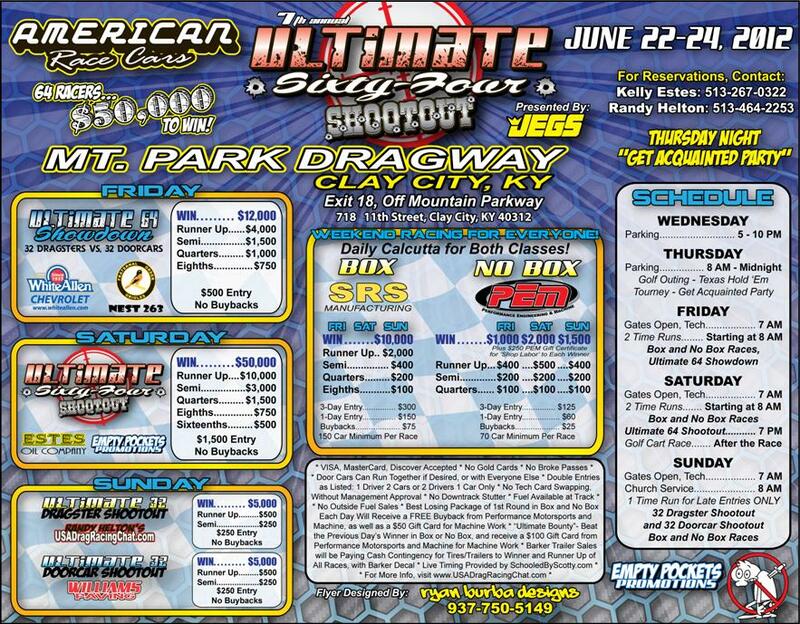 Clay City, KY - The action will kick off Friday, June 6 with the first of three SRS Ultimate 10’s. The SRS Ultimate 10’s are open to all competitors and are the only events of the weekend that are not pre-entry, set field races. These races pay $10,000 to the winner each day and feature $50 round money starting with third round winners. Clay City, KY - Mountain Park Dragway in Clay City, Kentucky will be hoting their 42nd Annual Ken-Mor Blue Grass Nationals on October 18th - 21st with Big Bucks Bracket Racing for Top ET and Mod Racers. Juniors and a Quick Shootout will also be run. 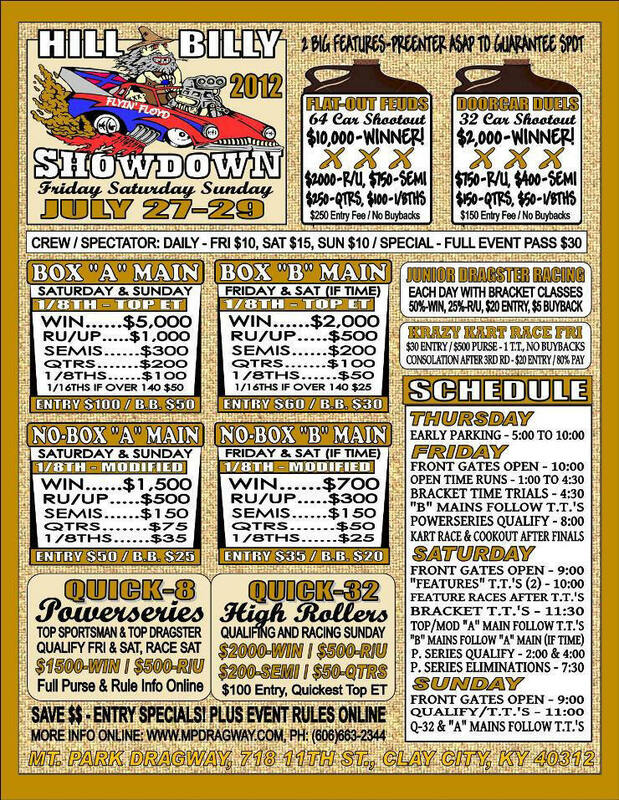 Clay City, KY - The 2012 Hillbilly Showdown hosted by Mt Park Dragway in Clay City, Kentucky begins this Friday. Big Bucks, Little Bucks, Quick Races and High Roller Shootouts offer a variety of racing for both Box and No Box Racers this weekend. Early Parking starts 5pm Thursday. 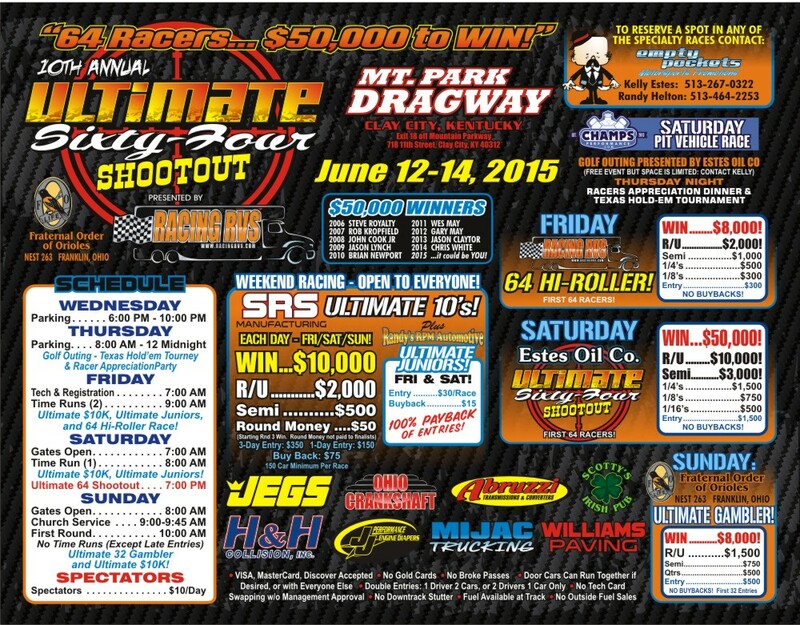 Clay City, KY - The 7th Annual Ultimate 64 Shootout returns to it origination place of Mt Park Dragway in Clay City, Kentucky this weekend. 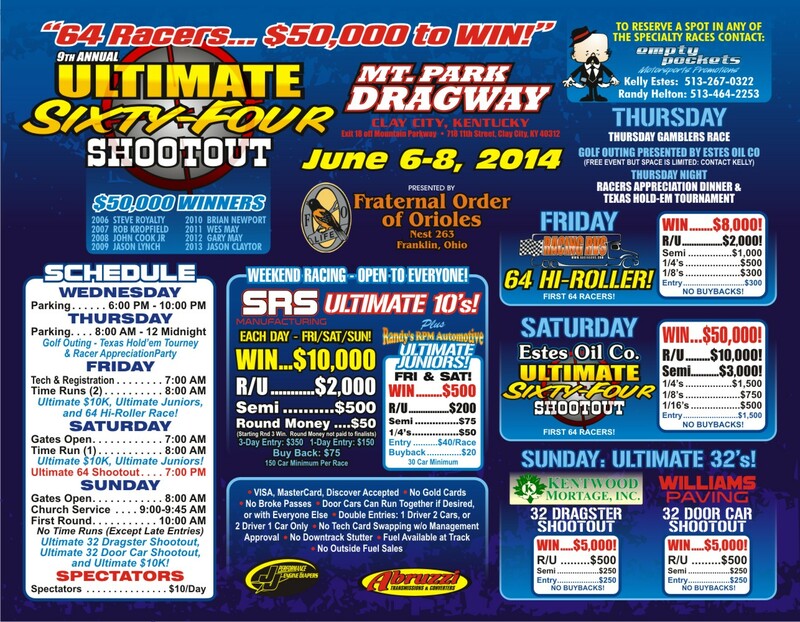 Highlighted by a $50,000 Ultimate 64 on Saturday, this race offers a host of races for all racers. 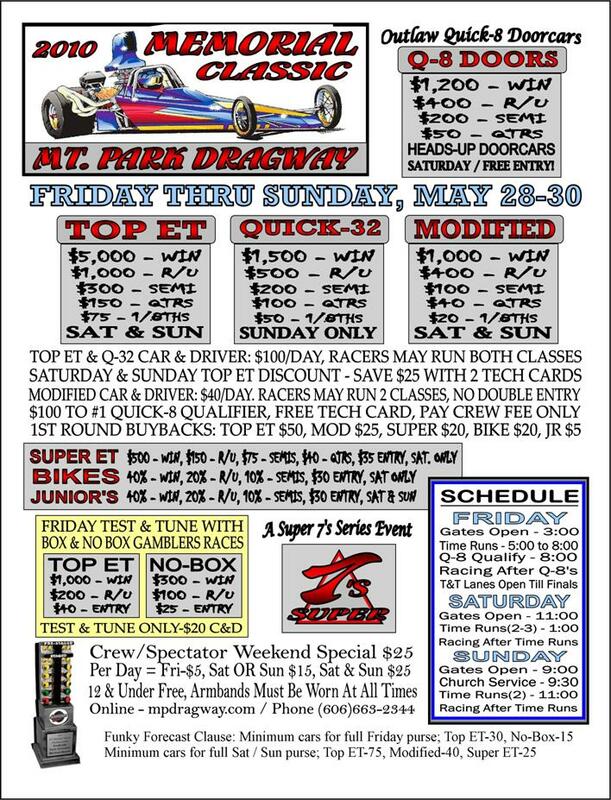 Clay City, KY - The 2012 edition will bring more of the same huge purses that the event has become known for, and a return to it’s original location: Mountain Park Dragway in Clay City, KY.
Clay City, KY - Big Bucks racing at it's best this weekend at Clay City. $20,000 to win 64 car Feuds, 32 car Doorcar Shootout, Quck 32, Box and No-Box races Friday, Saturday and Sunday. Gates open Friday at 11 am.